Sometimes, in the middle of doing something completely mundane, I will think to myself that there are so many things that I have not yet taught my children. Most recently, while preparing dinner, I thought about how my daughter should know that you only use Wondra flour to make gravy. These are the things I forget to mention during the hustle and bustle of everyday life. They may not be as important as reading and writing, but you know...people will judge you on your gravy. Trust me. It's other things too. Little things. Like the fact that vinegar is the one and only thing you should use to clean glass, or that at least once in your life you should watch a sunrise. My daughter should know that you can put toothpaste on your zits before you go to bed and you'll wake up with clearer skin. I need to tell her that she should always wear cotton underwear and never a thong, which I have also heard referred to as a bacterial superhighway. Go ahead, use your imagination. My son needs to be taught to always let women through a door first and be seated first, and that the gender and age of the other passengers plays a part in when he should exit an elevator. They need to know that hard work builds character, that nothing is free and that there are a whole lot of people in the world who don't believe either of those things. Oh, and if you put feminine hygiene powder in your shoes, it will take the feet smell away and if you wait until your spouse goes to bed, he or she will never know that you put Vagisil in their boots. I want them to understand that there are certain things on which you don't skimp, such as toilet paper, paper towels and car tires. Their first tool should be a hammer, followed closely by an electric screwdriver, their first car should be a very large piece of junk and their first kiss should be with someone who really likes them and respects them. They need to know that nothing will hurt as much as their first broken heart, that All in the Family is a great TV show and that they must always floss their teeth. More than anything, I want them to know that it's okay to take risks, but they should never, ever be reckless. I had planned on writing a lovely, little Thanksgiving post today. Something to say that, despite the constant drama in my life, I am very thankful for a wonderful family, a good husband, (mostly) happy kids, (fairly) good health and for you. For the readers who support me and leave me witty and insightful comments when I need them most. But, just now, I went to make my crust for the pumpkin pie and after I added all the ingredients to my food processor the motor blew up. So instead of writing that lovely, little post...I'm going straight for the wine bottle. Happy Thanksgiving, everyone. Here's hoping your appliances don't bust. Things have been a little glum around here lately. Flu, pneumonia, blog-friends having massive strokes and perfectly wonderful children dying will do that to you. But, that doesn't mean I walk around with my head hanging low all the time. No! There are still some things that make me smile when life isn't throwing wrenches in my direction. Last year I wrote a post of my favorite things for my female readers to get a glimpse at what makes me happy. And, I know for a fact that one male reader used the list for gift ideas for his wife. Hi sweetie! Thanks for the Dyson! Given the state of the blogosphere (Look everyone, it's the Federal Trade Commission! ), I feel the need to say that no one is paying me for these product endorsements. I really like this stuff, and if something is listed it was paid for with my own hard-earned, lunch lady paycheck. Just sayin'. 1. So, speaking of that Dyson. Best. Gift. Ever. The two dogs we have are great pets, but their fur is the bane of my existence. 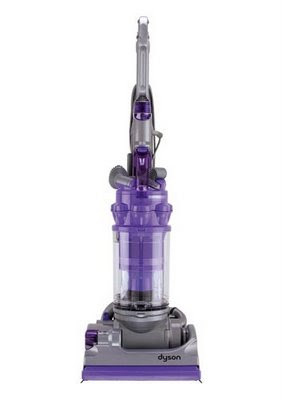 I sweep the floors with this vacuum cleaner every other day and the canister fills up TWICE. It's disgusting. And, totally awesome. 2. 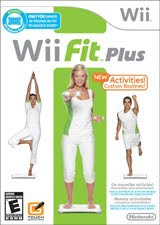 The Wii Fit Plus has given our family hours of entertainment and, instead of playing standard video games, my kids are working out. So am I. I dare you to play the flying chicken game and tell me your shoulders didn't burn. Seriously. I dare you. 3. 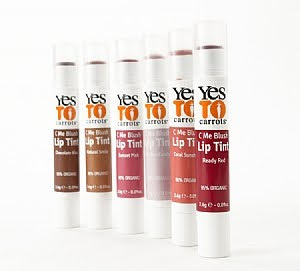 My Yes to Carrots lip tint in Chocolate Kiss. I got a free sample of this at the BlogHer conference I attended in July and have been addicted to it ever since. My lips are dry all year round and I apply Vaseline at bedtime and this during the day. It moisturizes wonderfully, looks good and tastes yummy. Bonus! Next, I want to try their body butter. Though it's possible I may slather it on my toast. 4. I used to make fun of my Aunt Shirley, because when she found an item of clothing she liked, she would buy it in every color. 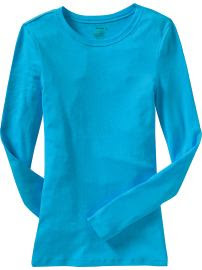 Which is exactly what I have done with Old Navy's Perfect Crew-Neck tee. You can wear it with lounge pants, you can wear it with jeans, or you can throw a belt around it and wear it with a skirt. Also, they're as soft as peach fuzz and you can't beat the price. Aunt Shirley is making me eat my words. Momo throws fist in the air and yells, "Dang you, Aunt Shirley!" 5. 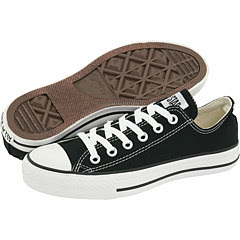 This classic Chuck Taylor shoe, by Converse. I don't own a pair. Yet. I totally dig that they're back in style though. They remind me of old photographs of my dad playing basketball. Dude could crossover dribble like nobodies business. 6. When I was at the BlogHer conference, I lost my little point-and-click camera (but, I did get that free lip tint...so it was totally worth it). 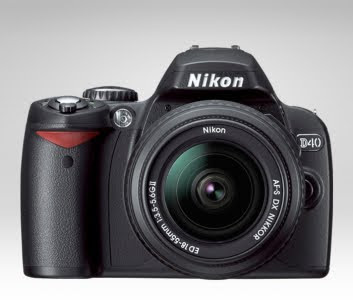 I came home, decided it was time to be a grown up and purchased a Nikon D-40. It takes beautiful pictures. Though it does have so many bells and whistles that I plan to take a class on how to really use it. But, it is mostly idiot-proof, which makes it the right camera for me. 7. 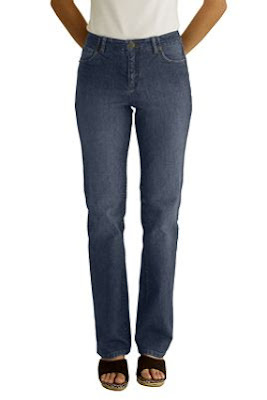 Lands End jeans. I'm 5'10". You can choose your inseam length. Enough said. 8. As for stocking stuffers, the OPI nail color I chose last year is so...well, last year. My new favorite? This lovely shade named, Significant Other. Mostly, I like it because my mom says nail polish should only be red or pink and deep inside I'm still 12 and want to get under her skin. Also, because I can introduce my husband to people, then hold out my hands and say, "And, this is my significant other." Then people think I'm crazy and I can avoid all that small talk stuff. 9. Have you ever taken a balloon and rubbed it on your head a few times, only to have your hair go all crazy-static on you? Yeah, that's my hair from October to May. Pantene Breakage Defense shampoo and conditioner help. A lot. When the weather gets really dry, I keep the conditioner on during my entire shower. My hair combs out easily and feels soft and silky. If I may say so myself. 10. I have said before that I hate winter, but there are a few delightful things about the season. Crackling fires, holiday lights and these socks from Bath and Body Works. 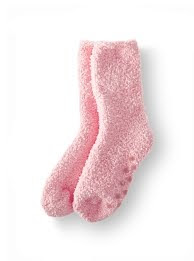 They're not called the Sweetest, Softest Socks Ever for no reason. Plus, they have those little non-skid things on the bottom for the nights when you've put too much rum in your egg nog or mornings when you've put too much Bailey's in your coffee. Or, if you're like me and you're just a complete klutz. This is nothing new, but the circumstances behind my insomnia were. I was thinking about cheeseburgers. I was thinking about cheeseburgers, because that's what we're having for lunch today and my boss won't be there which leaves me in charge of making sure 200 kids get fed. On time. So this pressing matter kept me awake, but after a while my mind began to wander. It wandered to a fellow blogger, Anissa, who had a stroke yesterday and is in ICU. Anissa started blogging after her daughter was diagnosed with Leukemia. Which led me to think about the little girl I know who is dying of a brain tumor. And that sent my thoughts to some of the underprivileged kids we met last night at an event at the Boys and Girls Club of Columbus. Thinking of underprivileged people, led me to think about the soup kitchen my daughter visited with her Girl Scout troop yesterday. The soup kitchen where they serve lunch to 1500 people a day. Which brought me back to cheeseburgers. And I realized that lunch is really nothing to worry about. 1. If your 75 year old mother is preparing to move and keeps telling you how hard it is because she "has so much stuff", you won't believe her until you see it for yourself. 2. Because apparently you can't have too many vases. 5. And, clearly, everyone needs a set of everyday dishes and three separate sets of fine china. 6. Your sister, who lives with your mother part-time, and who was home ALL summer, may suddenly disappear to northern Ohio for "grad school" and "trade shows" and won't come home from the time your mother decides to move, until one week after the move is completed. 7. Which leaves you to pack her stuff up. 8. And, when I say "pack" I mean put her things into hodge-podge boxes, cart them across town, lug them into the new house and up a flight of steps, then throw them in a corner. 9. Your sister is lucky you love her. 10. Because she's a pack-rat. 11. You may be really excited to have this Friday off work, only to realize your mom really wants you to paint her new living room and dining room. 12. Your mom is lucky you love her too. 13. And when your mom lives just two minutes away instead of 25 minutes away, all of this will be worth it. When my daughter was two years old, I was making the bed one day when she came out of our bathroom chugging a glass of water. I said, "Boy, you sure are thirsty!" Then I realized that I hadn't heard any water running. I walked over to find a liquid trail from the doorway to where she had dunked her cup into the toilet. But, at least it was clean water. You know, with that bleach tablet in the tank and all. Other than that, and my son once taking a sip of dishwasher rinse aid, I haven't had to call poison control. However, if there was an emergency service to ask whether the dogs were going to die because of something they ate, I would have it on speed-dial. Our 11 year old Labrador has been the worst culprit. There was the time she ate an enormous, solid, chocolate bunny, the time a chicken bone slipped out of my fingers and she caught it in mid-air and swallowed it whole, and my personal favorite...when she ate a breast pad when I was pumping for my daughter. By the way, there is something infinitely wonderful about a man who will go through the dog's poop to make sure your breast pad hasn't entangled itself in the mutt's intestines. Hi honey! As for the new puppy...she has a penchant for dead squirrels, dead birds and my son's vomit. And, that bleach-filled toilet water? It turns out the dogs like that too. I suppose I should count my blessings because my kids never ate any breast pads. Tell me boys and girls, what's the worst thing your kids (or pets) have ever ingested? On Friday afternoon I sat down to write this post, but I couldn't come up with the right words. I tried again yesterday and here I am again, on Sunday evening, and I am still at a complete loss. It is, quite simply, too painful to trivialize with my voice. So it has come to this. At a time when there is nothing I can say, I will simply state the facts. * On February 17, 2004, my niece, Madison, died just shy of her first birthday. My son was too young to comprehend her passing. My daughter was five years old and understood all too well that her cousin was gone. * On March 1, 2004, a schoolmate of my daughter was run over in our preschool parking lot. Michael was three years old. Telling my daughter that he had been killed in an accident was one of the hardest things I've ever done. * On September 1, 2007, one of my son's preschool classmates passed away. John was five, as was my son. My son was far too young to say goodbye to a friend and his friend was far too young to die. * On October 15, 2009, a little girl who attended school with my daughter and whose family goes to our church lost her battle with Fanconi Anemia. Samantha was 11. * And last week we learned that a nine year old at the school has an inoperable brain tumor and isn't expected to live more than a year. A girl who used to play on my daughter's soccer team and who, until last week, seemed perfectly fine. Another child. I can not bear it. I have not told my children yet. My 10 year old daughter and my seven year old son shouldn't have to deal with losing their friends. Not so many of them. Not in the midst of childhood which is supposed to be carefree. In the school kitchen where I work, things get hot. Not hot like a humid day in Florida, but hot like a humid day on the face of the sun. At any given moment we could have our ancient oven running, along with the convection oven and three warmers. Add in the steam from the dishwashing sinks and you have yourself your very own steam room. You know, kind of like a spa. Yesterday, I gave myself a green bean facial. The school doesn't have central air, so to cool the area we use a window air conditioner. That's right. A window air conditioner. If you stand in one particular spot by the trash can, you can almost feel a small breeze. Almost. But, the heat doesn't cause me to have a bad attitude. Quite the contrary. Because yesterday I told the ladies I work with that if I ever hit the lottery, I'll totally buy them a new window unit. There are a lot of things you give up when you have children. You simply have to learn to let some things go. Like a good night's sleep, disposable income and liquid assets. You also have to accept the muddy floors, juice stained school uniforms and beds that don't make themselves. You have to understand that the bathmat will get soaked, that little children like to smudge up the television, the computer monitor and the car windows, and even though a backpack has come home without the slightest remnant of a snack for over a month, it doesn't mean you won't look in there one day and suddenly find a small container full of moldy strawberries. Hypothetically. However, since I started my new job I've found it really hard to let those things go ignored because I just don't have the time to deal with them. It's one thing to see a load of laundry sitting on the floor in the basement and think, "I'll get to that later" and it's something else entirely to actually get it done. It didn't used to bother me if I saw a pair of socks on the living room floor or dishes in the sink, because I knew I would have time to take care of it. Now, I simply don't get that chance. It's frustrating and I have been letting it drive me crazy. Yesterday, in the midst of cleaning the house, my daughter asked me to stop and listen to her play a song on her electric piano. As I sat on the edge of her bed and listened to her play Pachelbel Canon, I realized that I really need to stop worrying about whether the floors need swept or if the blinds are dirty. Because as she played that beautiful music all I could think about was how dusty her keyboard was.